You have to like the nice people at Sky. 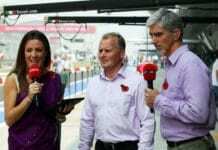 Not only did they arrange an opportunity for Badger and others to have a chat with Johnny Herbert, but at the same time announced that he will be on-board (not in the same way as a camera) with them for the next five races. So, naturally, we were delighted to take up the offer. Q: You’ve been a steward twice so far this year, so is it something you enjoy and do you see any way in which proceedings, and meetings such as the drivers’ briefing, could be made more transparent to the public? JH: Absolutely. I’ve definitely enjoyed being one of the stewards and I think it brings a much greater degree of consistency to the discussions of incidents – there were times when I was racing that officials had made up their minds before the drivers even arrived and we weren’t allowed to say anything. Given that many of the stewards had no experience of racing, it gives a great deal of credibility to the teams, both for drivers and the teams as a whole. Q: And with the Senna movie, we’ve had a bit of a taster about the driver meetings, so do you think there’s any way that a summary of the proceeding could be published to fans, even at the level of “Charlie told the drivers that crowding like we saw in Bahrain will not be tolerated and the rule will be interpreted more literally”? JH: Well the meetings aren’t like that any more! I’m pretty sure that Charlie will have something to say, but it’s a difficult area, and one that’s difficult to know what will be said. It’s a bit like when Lewis had a couple of funny moves in Malaysia a couple of years ago – I think this time Fernando will be asking questions, and they’ll be answered so that drivers know where they stand, but I obviously don’t know how Charlie will deal with it. Q: What about the local stewards in places like Korea and India where’s there’s very little motorsport – do they have enough knowledge to have a valid input? JH: The guy we had in India when I was the steward there was pretty good. His son races in the Scirocco Cup in Europe so he has a good idea what modern racing is all about. Q: Do you think McLaren will win in Spain? JH: They seemed to have a pretty good time in Mugello, so there’s a good chance for them. I was talking to Ant Davidson yesterday and he reckons that the tyres won’t be so bad, but I’m not convinced. I think the tyres are still likely to present a problem and we could see an interesting race. Strangely, Lotus almost seem to be the most consistent of the top five teams. Q: Do you think Felipe Massa will still be in a Ferrari at the end of the season? JH: Well, Fernando is still backing him, but if he continues to struggle there’s bound to become a point where the team might have to make a tough decision. Fernando seems to be saying that the car’s not the best at the moment, and is very difficult to drive, so maybe it’s not that relevant at the moment. But in the end it’s down to him doing a good job. He’s won before in Spain so he might be potentially be more competetive, as he was in Bahrain where he’s done well before. But yes, he definitely needs some positive results. Q: Lewis’s deal with McLaren ends this year, should he move on? JH: Well, where would you go? McLaren are always there or thereabouts and they always manage to develop the car. So why would you want to go anywhere else? In my heart, he should stay where he is. Q: Stirling Moss has made the claim that racing is no no more dangerous than football. What do you make of that? JH: Well it’s certainly safer now. Much safer than in the sixties when Jackie Stewart was racing and I think that’s good. There’s no pointing in racing next to barbed wire fences for example. It’s safer for everyone – drivers, mechanics and fans – and I think that’s a good thing. Q: Which of the current drivers do you think is most like Ayrton Senna. JH: Of the top four drivers, they all have a different mix of abilities. Fernando and Lewis have the sort of edginess that Ayrton had. Jenson is more of the thinking ability he had, and both he and Sebastian are very good racers with Sebastian excelling at qualifying. So they all have different bits of what Ayrton had, but I don’t think any of them has put together an overall package in the same way that Michael did. He still has the closest overall package, even if the younger drivers have a bit of an edge on speed now. Q: Can you explain what the draw to race with Ferrari is? JH: They’re the only team that have been in F1 since the very beginning, and you only have to go to Monza to experience the passion of the fans: cheering and flag waving every time a car goes round and everyone wants to do well with them. You have to remember that there have been long periods without success though, and I think Jean Alesi, who I loved as a driver, went there at completely the wrong time. It was only when Michael went there with Ross Brawn and Rory Byrne that they became so successful and they’ve tailed off a bit since. They looked quite strong at Mugello though, so maybe they’ll be a bit quicker in Spain. Q: Do you think that pitstops have become too fast now? JH: No I don’t. I think it’s good for the team and for the mechanics to have that pressure, and the opportunity to perform on race day, it adds a certain edginess. And although McLaren have had a couple of problems recently, it’s also something that will swing the other way in the future. So, many thanks to both Johnny and Alison from Sky in organizing the call – we look forward to another session where we can ask the rest of our questions! Note: Johnny’s answers above are intended to convey the essence of what was said and are not direct quotes. Badger paws are not too adept at operating a recording device at the same time as dialling into a conference call! Previous articleExactly what is F1?